light | ...and another cup of coffee. …and another cup of coffee. 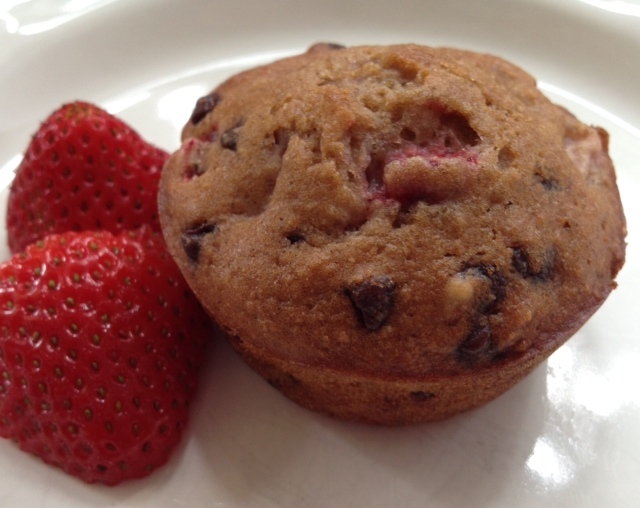 Strawberries are in full swing right now and I love to think of different ways to use them. Usually, my daughter in hales them within one or two days, never giving me a chance to bake with them. Yup, I felt like one stealthy momma! And once again I’ve been trying to bake with out using butter or oil and this recipe is another winner. For the health-conscience out there this recipe uses no butter, oil or egg yolks. They are substituted with unsweetened applesauce and egg white. Preheat oven to 350. Spray muffin tin and set aside. In a large bowl mix flour, baking soda and cinnamon. In a separate bowl mix brown sugar, applesauce and sugar until there are no lumps. Then add the egg white until mixed well. Add the wet ingredients to the dry ingredients just until combined (do not over mix). 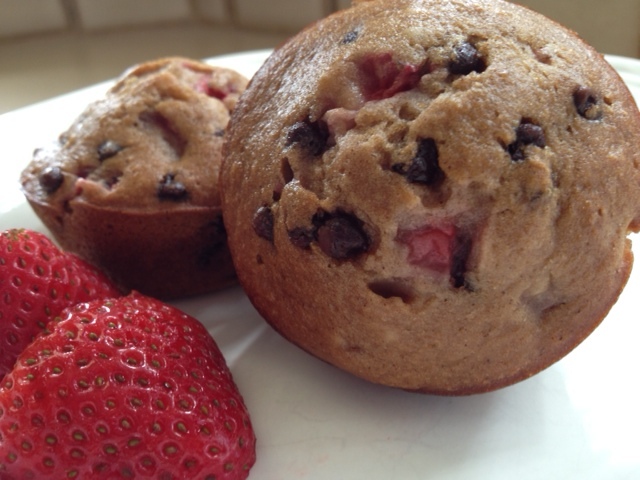 Fold in strawberries and mini chocolate chips. Divide the batter evenly between about 10 muffin cups in the muffin tin. Bake for about 15-20 minutes. Sorry I’ve been gone folks, but I’m finally back! Free sample of new Starbucks Latte K-Cup pods! Easy Pumpkin Spice Chocolate Chip Cookies (3 smart points)!